TruYou shows buyers and sellers that they can trust you more easily. When you apply, we’ll check your state-issued ID (like a driver's license), your cell phone number, and a selfie you take from inside the app. For security, we don’t store your ID on our platform, and buyers and sellers won't see your ID, phone number, or selfie. 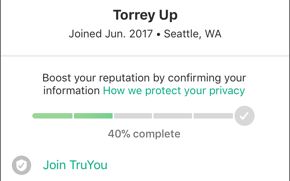 Once you’re verified, you'll get a special TruYou badge on your public profile. In the OfferUp app, tap to view your account. 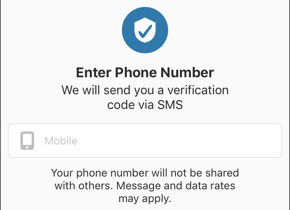 If you haven’t already confirmed your phone number, tap Verify Phone Number. Enter your mobile phone number. We’ll text you a code that you can submit back to us through the app for confirmation. Landlines and virtual phone lines don't work for texting. If you're asked for your Facebook profile instead, you may have an outdated version of the app. Submitting the info will still work, but we recommend updating to the latest version. Tap Verify Official ID, and take two photos of your US government-issued photo ID: front and back. Take a selfie! Line up your face in the screen, and blink your eyes to take the picture. 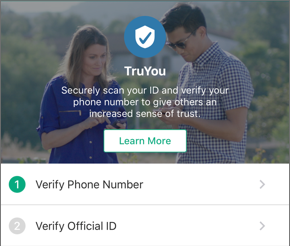 Usually it only takes a few minutes for TruYou verification, but it can take up to 48 hours. When it's done, you'll get an email confirmation and your profile will be updated to show your new badge. What information is shared with other users?